An attractive 10x8ft metal shed in a gardener’s green colour enabling it to blend into your garden. 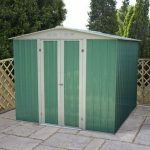 Made from galvanised steel, this shed is strong, durable and will protect your outdoor and garden equipment and items from the elements year round. 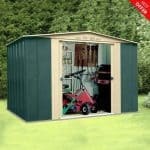 The Carrington is a handsome looking metal shed with plenty of storage space inside plus it is lockable. Constructed from galvanised steel it will last for years such is its weatherproof, rust proof and fire resistant properties. It has deep roll-formed wall and roof panels giving it extra strength and it has front and rear vents. The large sliding double doors give you plenty of room for transporting equipment inside and out and you can safely store all your garden equipment, garden furniture and children’s outdoor toys safely and securely. This shed comes with a 15 year warranty. When purchasing a shed you may find yourself overwhelmed by the sheer choice of sheds available. From traditional wooden sheds to modern plastic and metal sheds, all have different features to offer and aspects that may appeal to you. 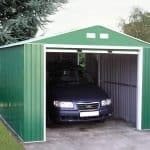 Below the team at whatshed.co.uk take a look at this particular models features and benefits of a metal shed. 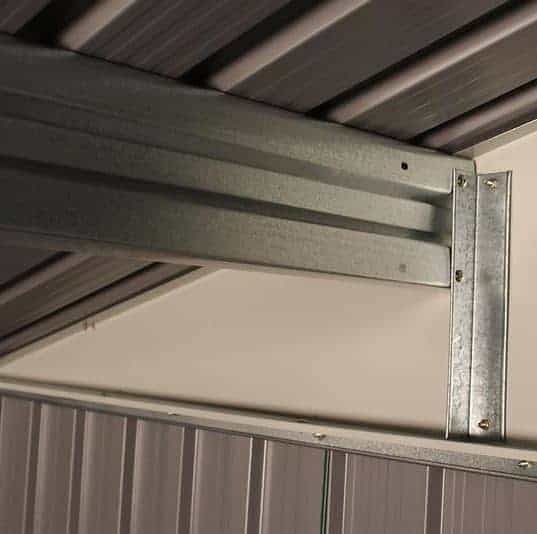 Exterior: Thanks to the corrugated walls and roof made entirely of tough and durable galvanised steel you will have peace of mind knowing that your items are protected whatever the weather conditions outside. With a 15 year no rust perforation warranty, Billyoh are confident that their construction materials will last the distance and be stood in your garden for many years to come. Interior: The 10x8ft interior provides a spacious floor area for all of your outdoor and garden equipment, furniture, tools and toys. With more than enough space for an average family’s belongings, you could also consider adding freestanding shelving for organisation and easy access of your smaller items. Double doors: Fantastic sliding double doors give a wide access to take items in and out of your shed at your convenience. 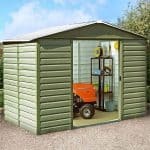 With a width that will allow larger items such as bikes, lawnmowers and furniture through with ease; these double doors enable you to get a good overview of the contents of the shed also. 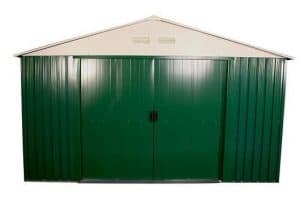 Security: The Billyoh Carrington metal shed comes complete with lockable double doors, meaning you can feel able to store your more expensive items such as tools or the like with the peace of mind that they are secure when not in use. 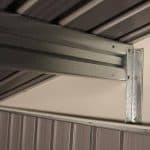 The Billyoh Carrington Metal Shed: How easy to build? This is a relatively simply shed to put together, with no complicated features or fittings to navigate. It is recommended that a team of two work together to assemble this particular model of shed due to the size and height of the structure and weight of the metal panels. We expect that this shed could be built within a day by following the step by step guide including detailed instructions and easy-to-follow diagrams. A basic tool kit will be required for assembly however all of the parts, fixtures, nails and screws required will be provided in your package. 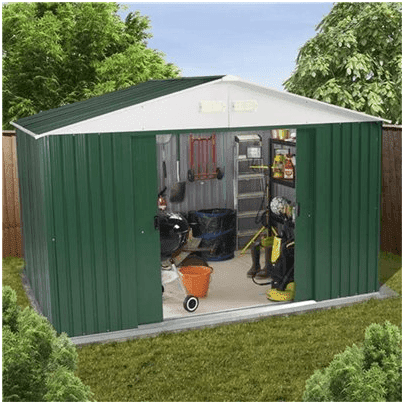 The Billyoh Carrington Metal Shed: What is the overall quality like? Billyoh are a British company specialising in garden buildings that combine style with amazing designs and high quality construction materials. With the Carrington metal shed, Billyoh have designed it with durability and protection in mind against even the harshest weather conditions. 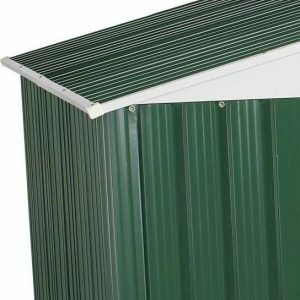 Corrugated wall and roof panels made of galvanised steel provide the ultimate tough and durable exterior to protect your items from the elements including weather, rust, rot and damp. With air vents in the roof, fresh air will be able to enter the interior to protect your items also. The benefits of a metal shed against a traditional wooden shed are that it is maintenance free which is great for those with a busy lifestyle. If your shed is ever in need of a clean, in order to maintain its smart appearance simply hose down with water – simply as that. 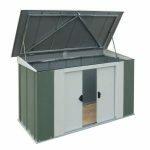 This fantastic metal shed provides a spacious 10x8ft interior for all of your outdoor and garden equipment. The tough steel exterior provides protection all year round from the elements and the lockable doors provide security for your equipment and peace of mind for you. 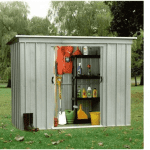 With a whopping 15 years warranty, you’re getting a guarantee of quality and a lot of shed storage space for this fantastic price. An excellent buy all round!